I won’t go too heavily into the plot as it follows all the same story beats as the original. A solicitor named Renfield (Pablo Alvarez Rubio) travels to Dracula’s castle for a business opportunity, gets drugged and becomes his slave. Dracula and Renfield then travel to London (now Spain) aboard a ship where Dracula kills everybody. They arrive in Spain and Dracula preys on the cultural elite, take that you damn one percenters. My initial reaction was how much slower events unfold in this version of Dracula. Or should I say, “Drácula” with a cool accent mark. More time is spent in Conde Drácula’s castle with more dynamic angles and camera movement. The original looks stale in comparison. We also spend more time on the ship, seeing the frightened faces and corpses of its ill-fated crew. These are good areas to dwell on as the beginning and ending of Dracula have always been its two strongest points. The middle? Not so much. I don’t know what it is about Drácula, but the story always seems to drag at the halfway mark. A lot of time is spent discussing Drácula and how scary he is, but you know what would be better? Scenes of Dracula actually doing scary things. I don’t care about boring rich people complaining. Of course these scenes are even longer with the film’s additional 30 minutes of runtime. One plus is the story feels more comprehensible with more time spent on character motivations and relationships. We also get more screen time with Mina, now named Eva (Lupita Tovar) who is far more captivating than Helen Chandler—no offense H.C. I’m also reading right at this very moment that Lupita Tovar is still alive and is 105-years-old! Damn! She was even alive to introduce the movie on the 75th Anniversary Edition DVD I own. Can you imagine living long enough to celebrate the 75th anniversary of something you participated in? Despite the film lagging in the middle, as the original did, it’s impressive seeing the wide range of camera techniques employed. A big portion of this could be attributed to the film’s director George Melford, who I was shocked to discover doesn’t even speak Spanish. What Melford had in his favor was decades of experience directing silent films. It makes sense. Film is a visual medium when you get down to it and functions best when visuals dictate the story. He don’t need no stinkin’ language. He had it inside himself all along. How about Conde Drácula? 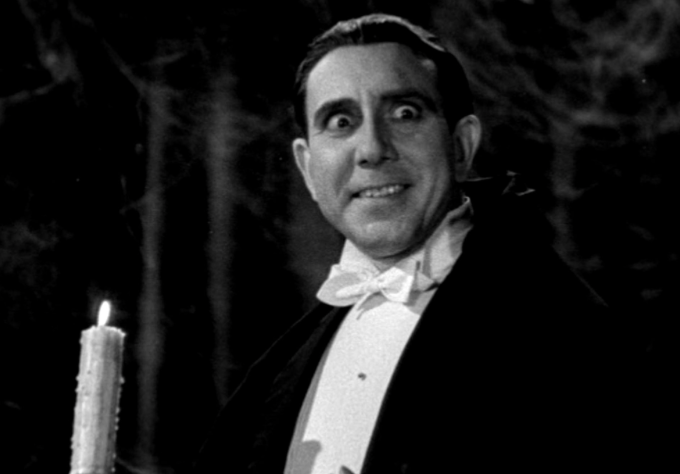 Surely, no one could live up to Bela Lugosi’s iconic portrayal, right? Right. 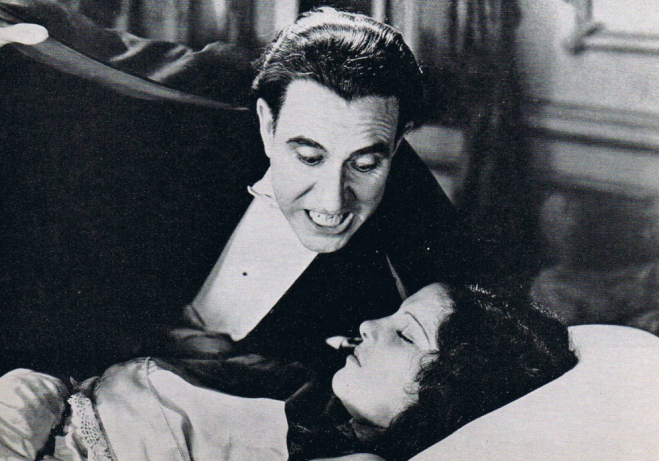 Lugosi is still untouchable. Don’t get me wrong. Carlos Villarias is a passable Dracula, he has some fun eccentricities, but so does a clown. Dracula should carry an heir of quiet respect, a charismatic yet sinister presence. Carlos Villarias on the other hand can’t seem to stop flashing his blocky teeth at the camera. We get it, it’s cool to be a vampire, show a little dignity. Villarias is more like a Dracula you’d see on a cartoon show or a made-for-TV-movie, he lacks the presence. Drácula is probably the weakest link, wherein the English version it’s the exact opposite. It seems to be the popular opinion among horror aficionados to go ahead and say Drácula is superior to Dracula. I’m torn on the matter, but I think I have to agree. I may not like the extended runtime or its kooky Count, but its superior in every other way. There’s no editing mistakes, there’s more emphasis on cinematic technique, the story makes more sense, it’s scarier. It’s better. I said it. Why do I feel so unclean? If only Lugosi had redone his part for this version it could have been the perfect film, but he’s no Laurel and Hardy. I mean, who is?